You won’t sound good unless you tune your ukulele! One of the most important things to learn early on is how to tune a ukulele. Each string needs to be at exactly the right pitch or your playing won’t sound good. 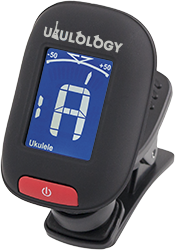 The best way to tune a ukulele, especially when you are just learning to play, is with a clip-on electronic tuner (like the Ukulology ukulele tuner). Clip the tuner to the ukulele headstock, turn it on, and hold the ukulele in the playing position. The notes to tune the strings to are (counting from the 4th string, the one nearest the ceiling) G, C, E and A.
Pluck the 1st string, and check the display on the tuner. It should show the letter A. If not, you need to think about the musical alphabet (A through to G, then repeat) and turn the tuning peg to either raise the pitch (tighten) or lower the pitch (loosen) of the string until the correct letter shows. Once you have the correct letter showing, you need to tighten or loosen the string to make the ‘needle’ point straight up to the top of the display. Once you have one string in tune, repeat for the other three. 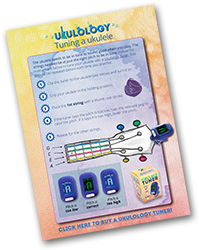 Check your ukulele tuning every time you pick it up to play, or every time your ear tells you something sounds ‘off’. Most of the time you’ll only need to make small adjustments, so only turn the pegs a little bit at a time, and keep checking your tuner. 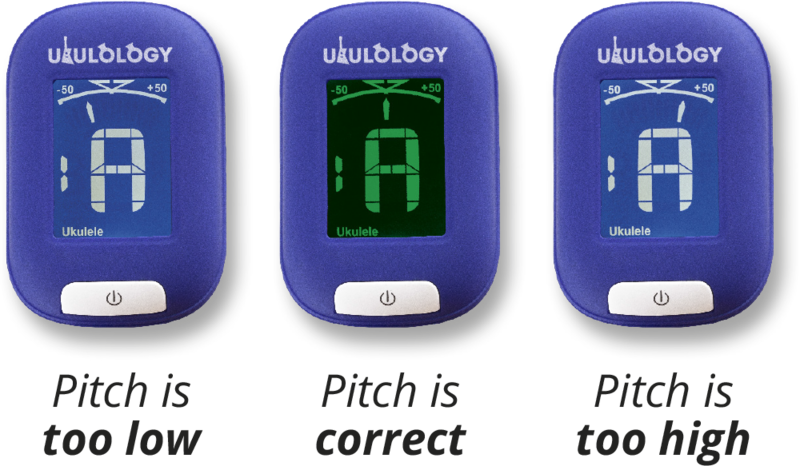 When using an electronic tuner to tune a ukulele, it will only work if it can feel the vibrations of the string, so make sure that you play a clear note and let it ring, and keep plucking the string every time you check your tuner. 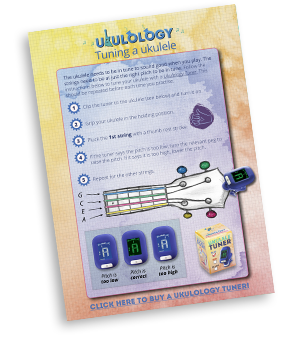 Download our FREE Tune a Ukulele PDF and always keep it with your tuner. Simply fill in the form in the green box for instant access (you’ll also receive 9 other useful ukulele PDFs! ).